Located between historic Wilmington, NC, and lively Myrtle Beach, SC, Brunswick County, NC is the fastest growing county in North Carolina and sixth-largest by total area. During the past 10 years, growth in Brunswick County has outpaced the state and nation by a large margin. Brunswick County experienced a growth rate of 29% since 2006, and is currently the 30th fastest growing county in the nation. “We’ve been on this trend for a while,” says Brunswick County Manager Ann Hardy in an article published on StarNews Online. “We’ve got a lot of retirees coming to take advantage of the many leisure pastimes we offer as well as the great weather.” To keep pace with population growth, the county’s building department performs 3,000 building inspections and reviews 100 to 150 applications for new residential or commercial building projects each month. The many inspections and applications generated a lot of paper that had to be transferred between different individuals and departments. Additionally, the county’s 846 square mile land area, much of which is rural or coast wetlands, presented a unique service delivery challenge. Here is how Laserfiche helps the county building department keep pace with growth. Depending on building permit type, a customer or contractor fills out one of two different forms. A change out/trade form is used for small projects, like replacing an air conditioning unit. A second form is used for larger commercial/residential projects, such as building a new house. The customer or contractor fills out the application in Laserfiche Forms. Different fields appear as the applicant fills out the form, so he only needs to provide the information that is relevant to the project at hand. The ability to hide sections of a form that do not apply to the submitter makes for a cleaner and easier to understand application. Customers and contractors fill out a Laserfiche form when they want to apply for a permit. Eighty percent of the forms are filled out by large contractors who apply for permits often and know the process well. The remaining twenty percent – smaller contractors or homeowners performing their own work – often need help with the application, so the form allows them to submit it with some fields left blank. Once the form is submitted, it is sent to the Intake group where it is reviewed by a representative. If something is missing or incorrect, the representative calls the contractor in order to complete the form or obtain the correct information. Once the application is complete, the Intake representative submits it. This action transfers the data to Brunswick County’s custom permitting system. The permitting system generates the permit and invoice, and saves both in Laserfiche. An automatic email is sent to the applicant with a link to the invoice and permit in Laserfiche WebLink. The applicant can then download the documents from the portal themselves. They have three days to pay the invoice. This is where the process for the change out/trade permit ends. Commercial/residential permits continue on. Brunswick County developed a custom in-house dashboard where the departments can view the status of all permits awaiting their review, and the appropriate employee can perform the approval or rejection. The dashboard is color-coded to help the departments view what permits need their attention. Permit applications and supporting documents can be viewed directly from the portal from an embedded Web Access view. The departments can select their decision from a dropdown field. Once everyone has either approved or noted that their approval is not necessary, the information is pushed into the permitting system where individual permits are generated. When a contractor is ready for the building department to inspect the item covered by the permit, he fills out another Laserfiche form online to schedule an inspection. The contractor simply fills in the project number, and the form displays a list of scheduled inspections that are still pending. This prevents a contractor from scheduling duplicate inspections. Information on the form for scheduling inspections is automatically populated based on project and permit numbers. 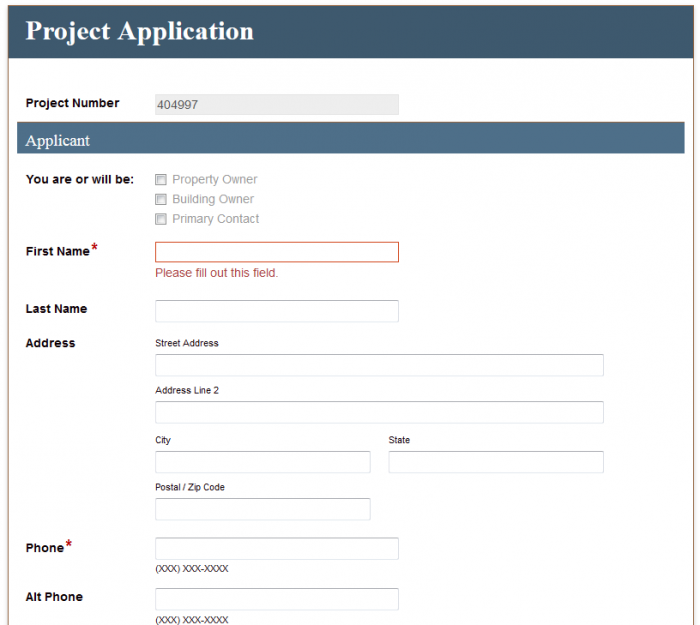 The rest of the form is automatically populated with data from the permitting system. Data is also pushed to the ESRI Collector for ArcGIS geographic information system (GIS). Inspectors go into the field with an iPad, which they can use to view a map of all the houses that they need to inspect that day. When they click on a house, all the details from the relevant forms appear. Inspectors also have access to Laserfiche Mobile so they can view any documents associated with project. The Collector for ArcGIS data entry form has a hyperlink to open Laserfiche Mobile to the project folder. They can approve or deny the inspection via the map and that information is pushed back into the permitting system. An integration with the GIS system allows an inspector to view all inspections that need to be performed on a map while he is in the field. Inspectors can view inspection information in a custom portal on their iPads. Once all inspections for a new house have been approved, the permitting clerk opens the permitting system and launches a brand new certificate of occupancy form by clicking a button. When the form is submitted, the applicant receives an email with a link to the Laserfiche WebLink portal, where he can download the certificate of occupancy. Contractors can download permits and other documents from a Laserfiche WebLink portal. Contractors have access to all inspection information while in the field via their iPads. Contractors no longer have to drive hours to submit permit applications or building documents in the office. All departments can perform their permit review at the same time, making permit generation much faster.